Redesigning a shopping centre to create the most attractive retail offer in the suburban catchment of Werribee. Buchan has long been a part of Pacific Werribee’s growth. Today, the centre has evolved into a one-stop fashion, food and entertainment destination to provide a well-rounded retail offer that’s comparable to inner Melbourne. Buchan’s design created a staged programme to minimise the impact on the existing trading centre. Now, the development offers a relaxed, comfortable customer experience. There are wide, sunlit malls, natural materials and marble stone floors characterising the spaces. A feature of the design is a new, al fresco restaurant precinct, complementing two new Gold Class cinemas. 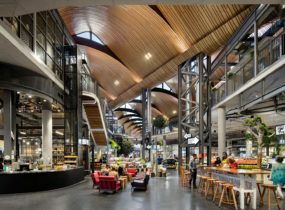 There is also an upgraded, two-level, 12,000sqm Myer department store, over 120 new specialty shops and kiosks, a new ‘hunter and gatherer’ fresh food precinct, 1,500 new car spaces and a new 10-bus interchange. We also designed a new contemporary branded image for the centre. As well, Buchan acted as the Executive Architect on the Urban Diner precinct featuring 15 restaurants which opened in June 2015, working in collaboration with MGS Architects to conceive the design.